If you’ve been on the internet this week—and managed to avoid getting blackout drunk or ripping your own eyes out in the last 48 hours—you’ve probably seen the following clip, an amazingly dramatic excerpt from the BBC’s Planet Earth II. 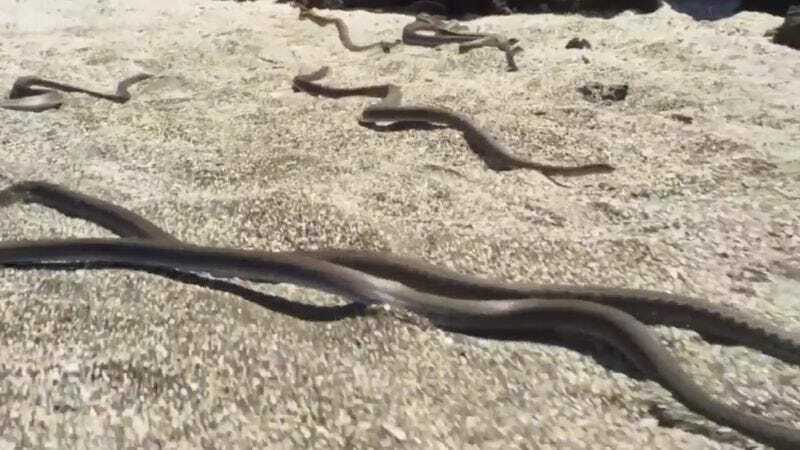 In the video, a newly hatched marine iguana in the Galapagos makes the run of its newborn life, racing away from a terrifying horde of bloodthirsty racer snakes. Now, Planet Earth II has released some behind-the-scenes footage of the making of the clip, allowing you to see more of the Galapagos wildlife, and get a taste of what happens to baby iguanas that aren’t quite so fleet of foot. Planet Earth II started airing in the U.K. on Sunday; unfortunately, it won’t arrive in the States (on BBC America) until January 28, 2017; in the meantime, we’ll just have to watch more clips like this one if we want to keep our minds focused on the relative kindness and safety of the animal world.